Offering a stunning and wide range of door handles, Handle World cements itself as one of the leading door furniture companies online. Their stylish designer door handles can help revitalise any home, but with Handle World it doesn?t have to come with a hefty price tag. 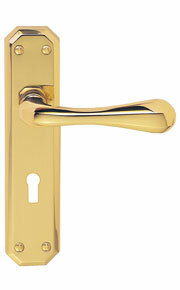 Handle World is part of Interiors Goods Direct Ltd, a top figure in the online interior goods industry. They have a passion for excellent customer service and a thriving desire to offer only the best at cheap prices. Handle World sell products such as round rose handles, back plate handles, pull handles, door knobs, cabinet handles, and many other accessories. You?ll be spoilt for choice when shopping at Handle World with so many different finishes; chrome, steel, silver, brass, antique brass, and more! All of your products will be delivered safely and quickly, and any order of ?50 gets free delivery. To help their customers out as much as they can Handle World have produced very clear and precise installation guides and door handle care guides so that your handles, locks and latches can be fitted properly, and last as long as possible. Contacting Handle World couldn?t be easier, phone them on 01924 481 713 or email them at info@handleworld.co.uk.